Squash and pumpkins are commonly grown in the Northeast by home gardeners as well as by commercial farmers for fresh market sales, for freezing and canning, or for Halloween and decorative purposes. Squash can be eaten fresh or stored for 4 months or longer under proper conditions. Both squash and pumpkin are susceptible to several diseases during the storage period or in transit if improperly cared for. Most of the diseases discussed here originate in the field during the growing season. For specific disease information see page 732.70, Gummy Stem Blight of Cucurbits; page 732.60, Anthracnose of Cucurbits; page 732.50, Scab of Cucurbits; page 736.20, Phytophthora Blight of Pepper and Other Vegetables; page 732.80, Septoria Leaf and Fruit Spot of Cucurbits; and page 732.90, Assorted Foliar Diseases of Cucurbits. Black rot, the phase of the disease called gummy stem blight that infects fruit, is caused by the fungus Didymella bryoniae as the sexual stage and Phoma cucurbitacearum as the asexual stage. Black rot is the most important disease contracted during storage of squash (butternut, Hubbard, and others), pumpkin, and even gourds in the Northeast. Affected fruit may show black rot lesions in the field before harvest, collapse soon after harvest, or exhibit lesions some time later in storage. Symptoms vary depending on the cucurbit infected. On butternut the lesions appear as superficial, bronzed, irregular patches and may show raised corklike areas (fig. 1). Another appearance is a reddish-brown ring-spot pattern that becomes bleached white (a petrified look) (fig. 2). These areas may be covered with fruiting bodies (pycnidia), black specks in a ring pattern as shown on pumpkin (fig. 3). These field symptoms and signs most often occur on the side of the fruit touching the ground because high moisture favors infection by the gummy stem blight fungus. Other pathogens, including Colletotrichum coccodes, which causes anthracnose of tomato and black dot of potato, may produce similar-appearing black-speck fruiting bodies on blackrot-affected areas. The actual black rot symptom on butternut develops while the squash is in storage, beginning as a bronzed, water-soaked lesion, followed by a black rot covering a portion of the collapsing tissue (fig. 4). Infected pumpkin may rot in the field, especially if moderate temperatures and high moisture levels occur, favoring the development of gummy stem blight without typical black rot symptoms. On pumpkins held for fall sales, a watersoaked lesion develops, usually associated with an injury to the rind (fig. 5), and soon black rot develops (fig. 6). Large Halloween pumpkins are more susceptible to black rot than smaller pie types. Because infection originates in the field, control practices include the use of disease-free seed, a minimum 2-year rotation out of all cucurbits, and fungicide sprays as required. When powdery-mildew-resistant (PMR) cucurbits are released, the losses from black rot may be reduced. Although this disease is more often a foliar and fruit-infecting problem for watermelon and muskmelon, the organism can also infect the fruit of squash and pumpkin. Anthracnose, caused by the fungus Colletotrichum orbiculare, like gummy stem blight (black rot), is favored by warm temperatures and high humidity and rainfall. Lesions usually develop while fruit is in storage. 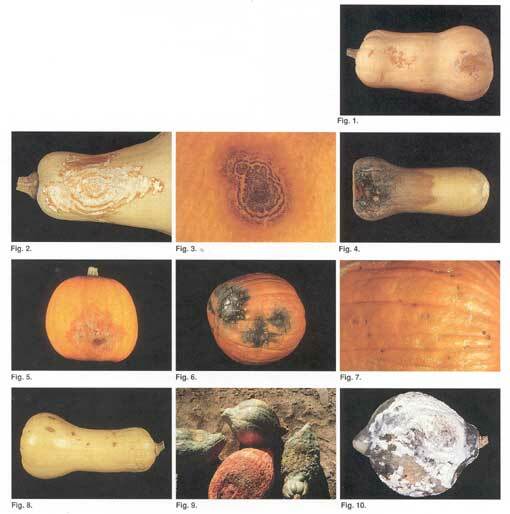 On pumpkin, lesions are mostly circular, sunken, and measure 2 to 5 mm in diameter or larger. Under humid conditions, the central area darkens and develops tiny black specks (fig. 7). On butternut squash the lesions are similar but may be larger and more elongate (fig. 8). Because the anthracnose fungus overwinters in debris, a minimum 2-year rotation out of all cucurbits is required for control. Phytophthora blight, caused by the fungus Phytophthora capsici, can infect the entire range of cucurbits and is a serious field disease. Because all aboveground plant parts can be affected, fruit that do develop are undersized and distorted. A white mold and fungus spores develop on the affected area (fig. 9), which later becomes covered with a yeastlike growth. Fruit should not be harvested or saved from fields showing Phytophthora blight because even healthy-appearing fruit will deteriorate over time. Because of the wide host range of Phytophthora blight, cultural practices and especially crop rotation are essential for control. White mold, caused by the fungus Sclerotinia sclerotiorum, can cause losses in the field and in storage. Pumpkin and Hubbard squash are particularly susceptible, especially when they are grown in rotation with beans or cabbage, which are also very susceptible to white mold. Decay is rapid, characterized by a watery, odorless rot and an abundance of white cottony mold in which the black resting bodies of the fungus (sclerotia) are embedded (fig. 10). The rot can spread by contact from fruit to fruit. Control requires rotations away from fields of other susceptible crops or with a history of white mold, care in harvesting, and proper storage conditions. Other rots of minor importance that can appear in the field, in transit, or occasionally in storage include angular leaf spot (Pseudomonas syringae pv. lachrymans), which occurs rarely on cucumber because it is resistant but occasionally on winter squash (see fact sheet, page 732.90, Assorted Foliar Diseases of Cucurbits, for illustration); belly rot (Rhizoctonia solani) of cucumber and muskmelon on the fruit surface in contact with the soil; blue mold rot (Penicillium digitatum) of most cucurbits on the blossom end; cottony leak (Pythium spp.) particularly of fleshy cucurbits such as cucumber and summer squash; Fusarium rot (Fusariurn equiseti) on pumpkin and as a secondary invader on butternut and Fusarium fruit rot (Fusarium roseum) on muskmelon; gray mold rot (Botrytis cinerea) on the blossom end of cucumber and in storage on butternut; scab (Cladosporium cucumerinum) on assorted cucurbits (see fact sheet, page 732.50, Scab of Cucurbits, for illustrations) but not on scab resistant cucumbers; Septoria fruit spot (Septoria cucurbitacearum) on pumpkin and winter squash (see fact sheet, page 732.80, Septoria Leaf and Fruit Spot of Cucurbits, for illustrations); and wet rot (Choanephora cucurbitarum) on the blossom end of assorted cucurbits, especially summer squash. See individual fact sheets for disease control strategies. Rots can originate from fruit infections occurring in the field, from a dusting of fungal conidia during harvest, or from direct fruit-tofruit contact in storage. The following practices should be employed throughout the season: crop rotation, use of disease-free seed, good field drainage, good insect and weed control, appropriate timing of fungicide sprays, care during harvest, sanitation of storage facilities and containers, and postharvest control of storage temperature and relative humidity. Only mature and disease-free fruit should be harvested and placed under shelter before frost or freezing occurs. Winter squash and pumpkin are chilling-sensitive and may sustain injury at temperatures below 50° F. Chilling damage is cumulative, and the extent of injury is dependent on both time and temperature. Butternut squash are particularly sensitive to chilling injury. Although chilling injury may not be visible during storage at lower temperatures, the symptoms appear later after warming (usually during transit) as sunken pits in the surface where tissue has been weakened or killed by cold temperatures. Secondary pathogens can invade damaged tissue, resulting in rapid decay. Special care should be exercised to avoid rind injuries, which provide entry for pathogens. Under proper curing conditions, wounded areas heal themselves by producing corky tissue.Curing at 68-77° F for a week will harden the rind but is detrimental to the taste of some varieties such as Table Queen. Butternut, Delicious, and Hubbard squash and pumpkins respond to this treatment. Storage can then proceed at 52-61° F with 55-75 percent (optimum 60 percent) relative humidity. *Storage for 4 months or more is possible if all production, curing, and storage recommendations are followed. Choose a vegetable from the pull-down menu below to get a listing of Fact Sheets and Information Bulletins relating to that crop.